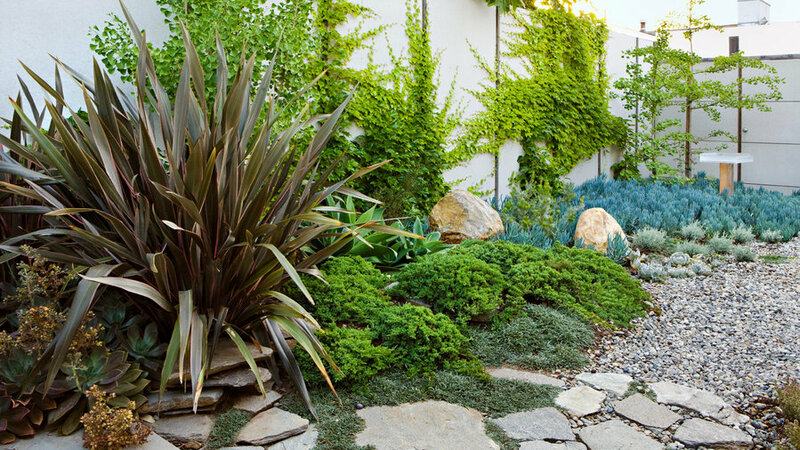 A garden should help you relax and reboot. That’s its proper purpose, according to the Japanese aesthetic called shibui. 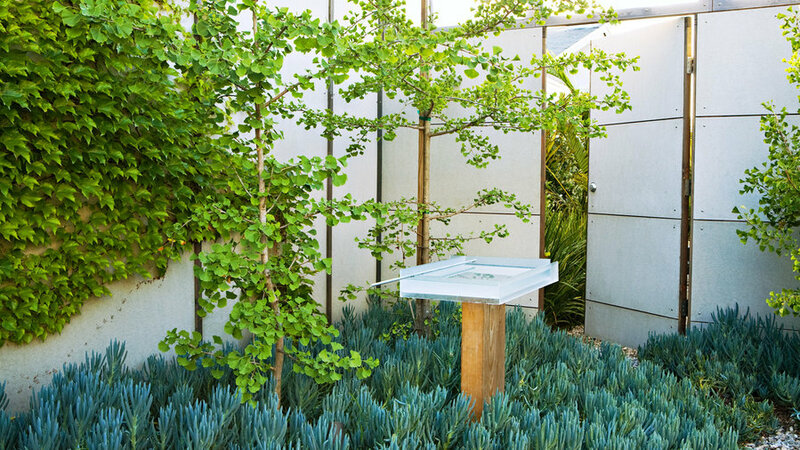 “We all need a peaceful place away from the craziness, and there’s no better spot for that than in nature,” says Venice designer André Price Jackson (), who embraces this philosophy—with a very West Coast spin—in his own garden. The plantings are spare, paving is natural. His art is easy and inventive. But you don’t need to create a garden that looks Japanese to achieve shibui’s effect. Just make its underlying design ideas your own. Japanese gardens feel serene because they’re not crowded. Bare spaces are as important as filled-in spaces. That’s why André left the center of his garden open and planted surrounding beds with ground-hugging plants like prostrate juniper, dymondia, and blue senecio. If you have a great natural view, by all means borrow it as the Japanese do. But this garden doesn’t happen to have one, so André turned to the nearby (but unseen) Venice beach for inspiration. He planted in waves and painted the walls the gray of coastal fog. Blossoms add vibrant color (attracting pollinators), but foliage catches your eye in a quieter way with contrasting textures. Tall flax, sturdy agaves, and fleshy Senecio mandraliscae grow next to fine-textured Boston ivy and groundcovers in André’s garden; the planting is simple and restful, yet interesting. The bright red piece hanging on the painting-studio wall looks like a bold sculpture, but it’s actually the mold for a battleship part. André loved its color, shape, and unexpected origins. The elements of shibui, according to André: peaceful and quiet. Subtle beauty with underlying complexity. Tranquil but not boring. He evokes these principles with the staghorn ferns hung over the sofa, which mimic the stag antlers that he found in Oregon and mounted at the wall’s top. 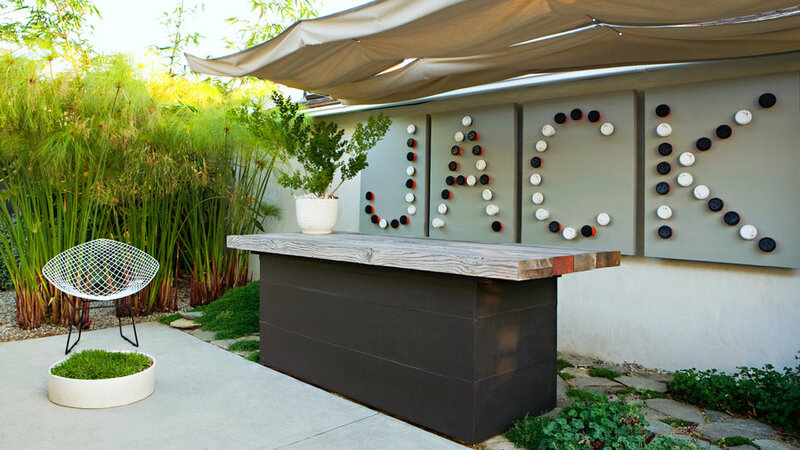 Stories hidden in André’s garden include the big JACK, spelled out in recycled latte lids on his studio wall. Each sip hole reveals a little memento: a favorite photo of his mother, a rivet from the Golden Gate Bridge, a seedpod from a hike. 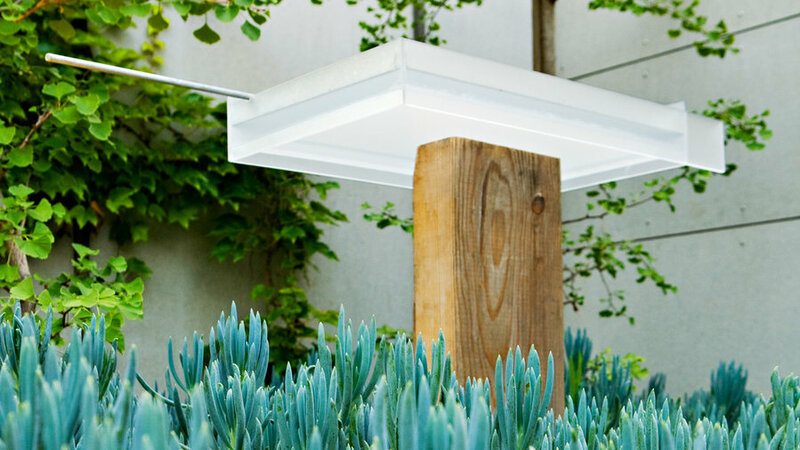 Knowing they’re there enriches his garden ­experience. Natural elements shine in the garden's furniture and décor. 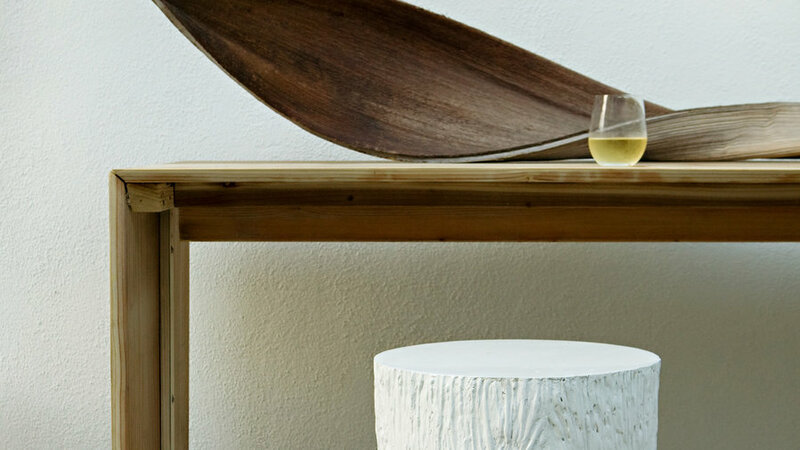 The palm sheaf on the table is real (blown down in a storm); the “log” stool is resin.